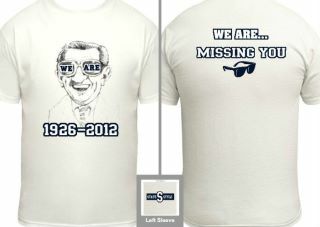 This shirt honors the legend who has built Penn State into what it is today, Joe Paterno. All profit raised from this shirt will go directly to the Special Olympics of Pennsylvania and THON, two orginizations that Joe and Sue strongly supported. In lieu of flowers, the Paterno family requested donations be made instead. Profit raised will be split evenly and given to each organization. Price: $15 to statestyleclothing@gmail.com via paypal (please include what size you would like) or we will have two days in the HUB where you can drop off payments. Meet us at the fish tanks on either Feb 1st from 3pm-5pm or Feb 2nd 12-1pm or 3pm-4pm. Free Shipping or available for pick up. Accepting Orders Until February 3rd at 12:00PM. After order period closes allow 10-14 business days for processing and production. For any questions or concerns please contact us at statestyleclothing@gmail.com.